Robert Scoble is a technology writer. And he writes a LOT. That aside he probably keeps connected with emerging consumer technology better than anyone else. 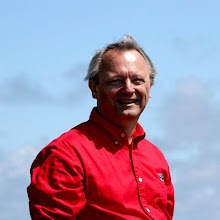 He has a recent blog post where he talks about how Qualcomm is showing us the future of the cell phone. Qualcomm just shipped a developer SDK, called Gimbal. This SDK talks to every sensor in your phone. The compass. The GPS. The accelerometer. The temperature sensor. The altimeter sensor. Heck, we’ve known about sensors in cell phones for a while now. ... these new systems are going to know whether you are walking, running, skiing. Whether you are shopping, working, entertaining yourself. Wait a minute. This sounds like the Jetsons. Here's one of his examples. In the future my cell phone will know I ordered a pizza. Will know when I get in my car. Will know who is in the car with me. And will give me contextual data that will make my life better. For instance, on my todo list I might have put "pick up a hammer at the hardware store." It will know that Round Table Pizza is near the hardware store. It will know I have an extra 15 minutes. It can use Waze to route me to the hardware store first, tell me to pick up my hammer, and then head to Round Table to pick up that pizza. While I can envision hardware/software with these capabilities, I can see real problems. Think about hopping the in car with your wife to go pickup a pizza that you ordered. 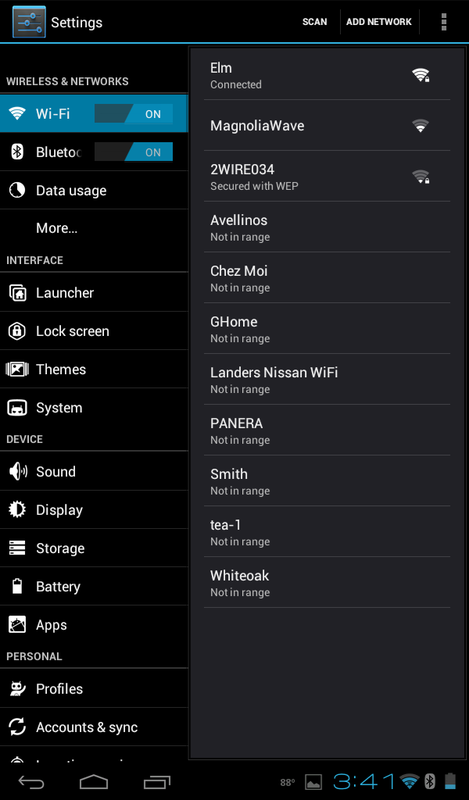 Your phone connects to the bluetooth in the car and runs through your todo list. It sees the opportunity to swing by the hardware store before the pizza is ready. It mutes the radio playing your wife's favorite radio station and tells you to alter your route to go to the hardware store for a hammer. How well do you think that will go over? This scenario can play either way. You hop the in car with your wife to go pickup a pizza that you ordered. 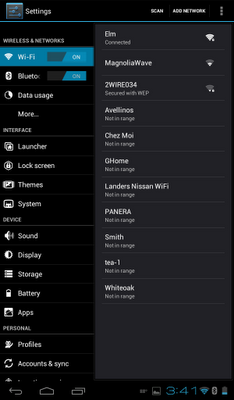 Your wife's phone connects to the bluetooth in the car and runs through her todo list. It sees the opportunity to swing by the the local department store to pick up those cute shoes she's been looking at on the web. It changes the route in your car's GPS and you're off to the department store. An hour and a half later your wife emerges with the shoes and a matching dress. And the pizza is ice cold. Every now and then one of the photos in the Photo Stream will look good but then be terribly pixelated when I send it to the iPad's Camera Roll. Here's an example of a photo that exhibited this. I had Googled without finding anything so I drove up to the local Apple store. I was greeted quickly and warmly and began explaining my problem. He said that that happens and I should make sure that I had captured all the photos in my Photo Stream and then reset the Photo Stream. He went on to explain that he didn't know why that happens and that it may happen again after I reset my Photo Stream. I joked with him that maybe I needed to go talk to one of their "Geniuses." He said he was the "Genius." I wouldn't have guessed that given his acne. I described to him that my desire was to transparently synchronize my Camera Rolls between the iPhone and the iPad. "You can't do that." was his answer. Both devices are using a common iTunes account. When I plug them into iTunes on my Windows PC they synchronize and then backup. Pretty clean. But the applications are synchronized as well. There are applications that I use on the iPad that I don't need or want on the iPhone. So I asked the "Genius" about this. He explained that I could go into the iTunes Preferences and select what to synchronize. So I interrupted him and asked if I could select which components to synchronize? Perhaps excluding applications? "You can't do that." was his answer. But the "Genius" wasn't completely right. 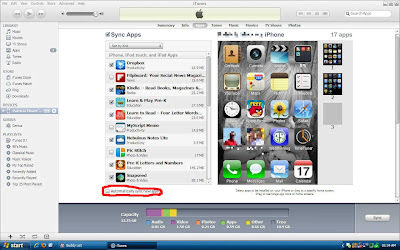 You can choose to not sync new apps. Chrome is continuing to grow on me. Version 19 introduced the capability of syncing tabs across browser instances. The Chrome blog made it sound like it would just happen magically. Not so much, at least for me. In May 2012 the blog said "the tab sync feature will be rolled out more gradually over the coming weeks." So I waited. And waited. After more than a month I started Googling to see if I could find when I was going to get it. I was already signing in to Chrome but with my Google Hosted Apps account. Sometimes new things get pushed to Google Hosted Apps accounts slower, e.g. Google+. What I found was that I was not the only one not seeing Tab Sync. The solution recommended was to go to chrome://flags. 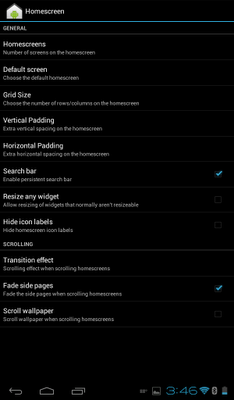 Scroll down in this list until you see "Enable syncing open tabs." Click on the "Enable" link and restart Chrome. Now go to the wrench icon in the top right and choose "Settings." Click on "Advanced sync settings..."
Check "Open Tabs" and click on "OK."
You will need to do this on every instance of Chrome. Now when you open a new tab in Chrome down at the bottom will be a link "Other devices." Click on this and you'll get all the open tabs on all the open instances of Chrome by machine name, i.e. T420S in this example. 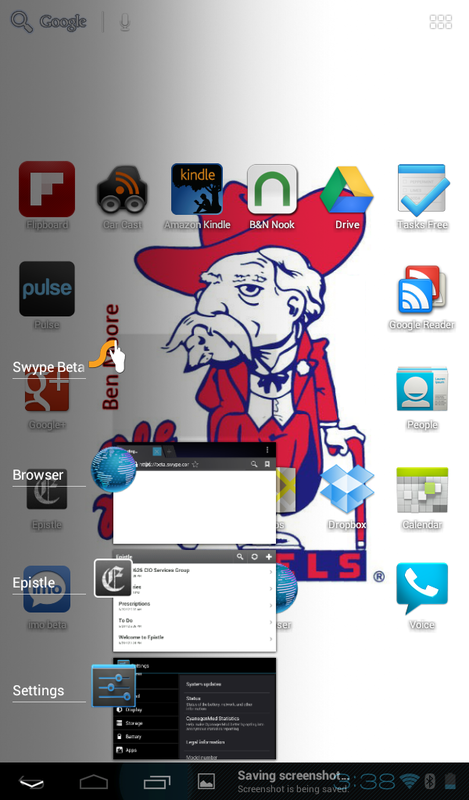 If that isn't cool enough Tab Sync also works on Chrome for Android and iOS. Recently one of my mentors tweeted a link to an article entitled "Building and dismantling the Windows advantage." Lots of statistics and a good read. Don't worry. I'm not going to use big words like pl8t0 did. First, the transition from Windows to Apple happens in "thunks." For example when I moved my wife from a BlackBerry (because Google dropped BlackBerry support) to an iPhone I should have heard the "thunk." 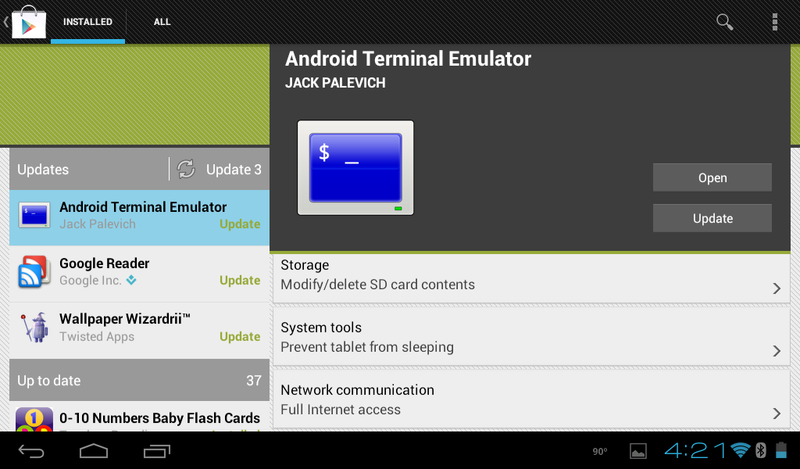 The next thing you know I'd sold my hacked TouchPad running Android and bought an iPad. Now the iPhone and the iPad are connected (and I use that term loosely) with the iCloud. The "thunk" happened easily at my house. "Thunking" in an enterprise won't be so easy. Current technologies encourage homogeneous platforms. Even Mac and Linux users who interact with other businesses tend to converge using Microsoft Office file formats. Remember back to the migration from .doc to .docx. (You have done that haven't you?) Today making an enterprise "thunk" from PCs to Macs is a big transition. A side issue on this is that enterprises like to multi-source all their purchases. This doesn't necessarily mean that they have 2 vendors' products sitting side by side but that they have 2 vendors at least bid on a product, in this example a desktop PC. They may award all purchases to a single vendor for a fixed time (several years) then rebid the product. Since there's only a single source for Macs that would be a problem and require some rethinking of the acquisition process. Windows 8 will be a mover and a shaker in this arena. It could go either way. It could frustrate enterprises with the forced Metro interface or, if Windows Phone is adapted by the enterprise, complement the mobile environment. Too early to tell. Why don't you get me a Microsoft Surface for Windows 8 Pro and I'll give you some feedback? 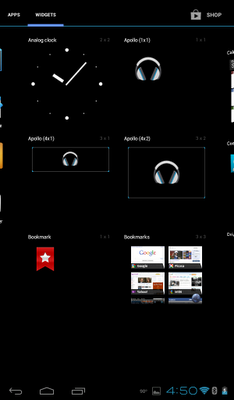 Second, I don't think the long term play is full function desktop devices. The "cloud" is the end game. I was speaking with an executive with a leading IT vendor recently and she was saying that she didn't understand why the iPad was taking off in the enterprise. She couldn't "do" anything with it. 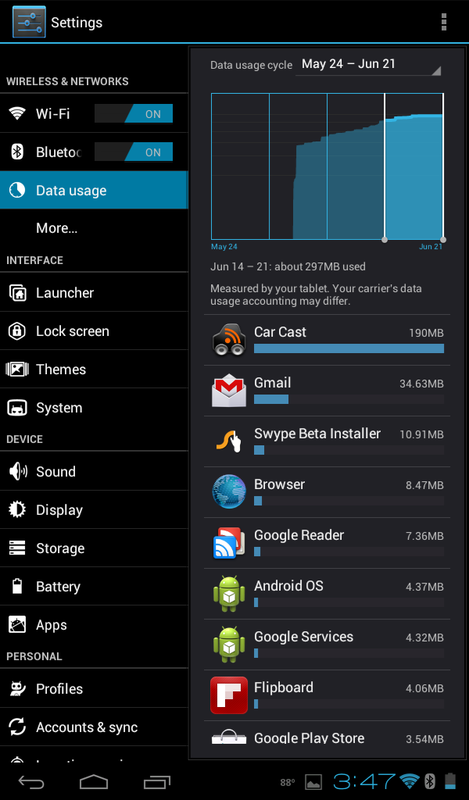 I pulled out my Android phone and showed her my instance of Epistle. On the iDevices I use Nebulous Notes Lite. 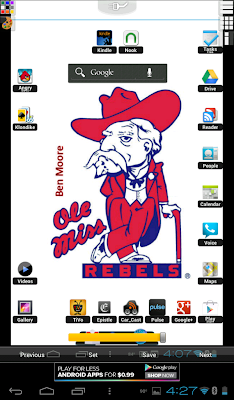 And on the desktop/laptop I use Wordpad. These apps leverage Dropbox to give me seamless editing of simple text documents wherever I am on whatever device I have at hand. It's an incredible experience. I understand that she was looking to be able to edit PowerPoints and Excel documents but that's just an issue of maturity in these applications. With the "cloud" it doesn't matter what your client is. I understand the enterprise concern over "cloud" security but I forsee that being overcome by private clouds, e.g. SharePoint. Remember the Chinese curse, "May you live in interesting times." We certainly are. I tried to keep my Nook Color Ice Cream Sandwich post concise but I actually have a lot more to talk about so here goes. 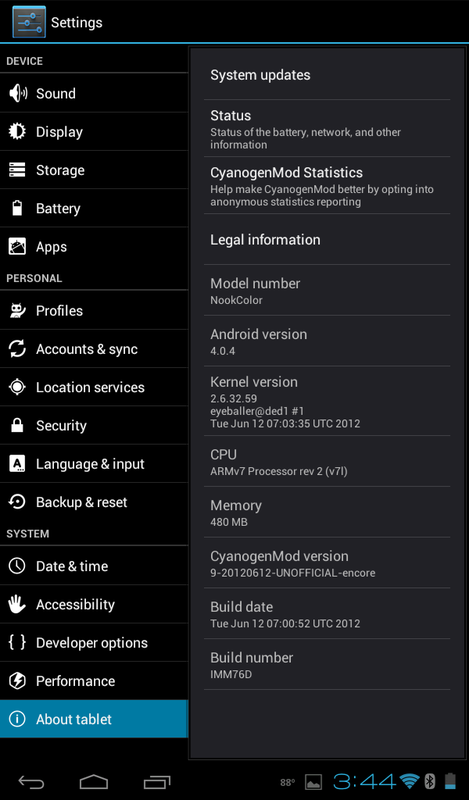 Remember that I'm running CyanogenMod 9. I also found an article in Computerworld about the Tablet UI. If you need to get some sleep you can go read the Android 4.0 SDK documentation. Start with the Action Bar. 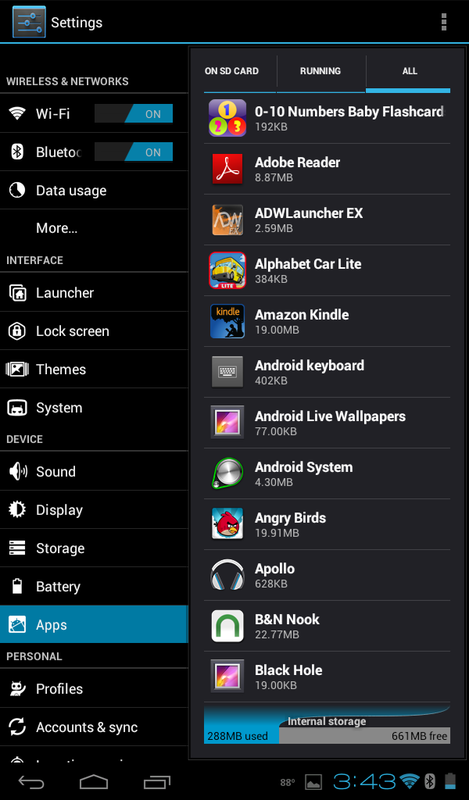 I'm using the stock ICS launcher, Trebuchet. The top left is obviously the "Search Bar." 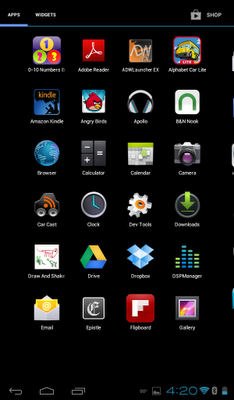 At the far right, the grid opens the App drawer. 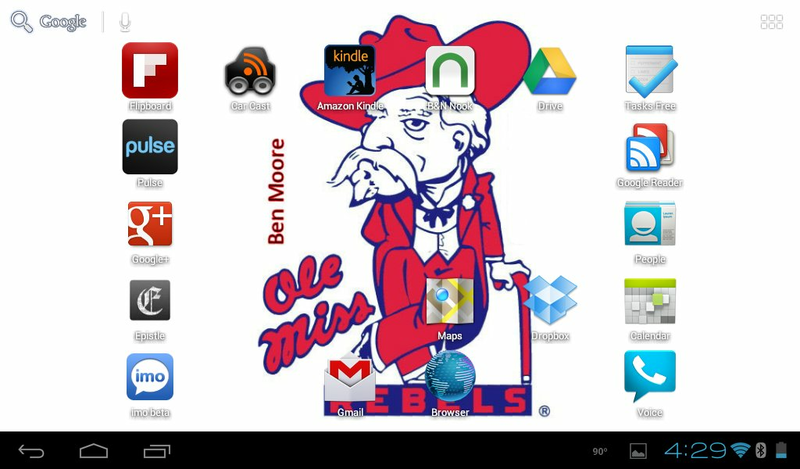 There's not an App dock at the bottom in the Tablet UI. I can only get the grid to be 6 icons wide and 5 icons deep. The "Notification Bar" is at the bottom. 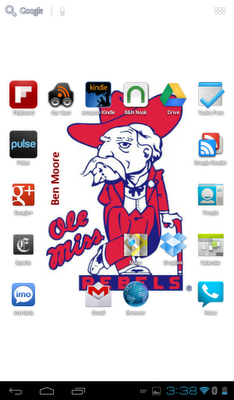 The icons from the left are Return, Home, and Recent Apps. The notification area is at the right. You didn't see a Menu icon did you? If you tap one of these thumbnails you are taken to that app. If you swipe it right or left the thumbnail disappears. I'm not positive whether the app is actually closed at that point or not. Notice that the Return icon changed to what I'll call a Dismiss icon. Tap it and the "Recent Apps" menu disappears. Swiping one of the notifications, in this case "Snapshot captured." dismisses that notification. 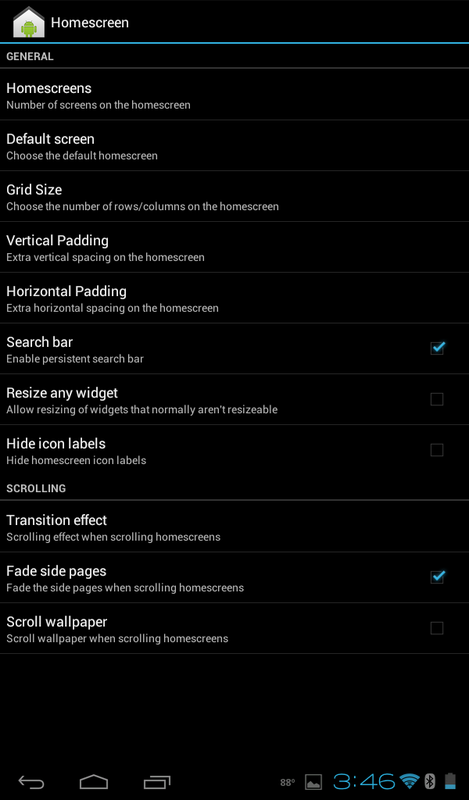 Tapping the icon that looks like 3 sliders opens a subset of the Settings menu. Check the date and time to see how long it took me to get that screenshot. 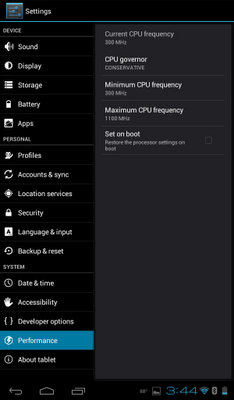 Tap the "Settings" choice and you get the full "Settings" menu (finally). In the "Wi-Fi" settings you begin to see the tablet presentation. The action choices are in a column on the left and the details are in a column on the right. 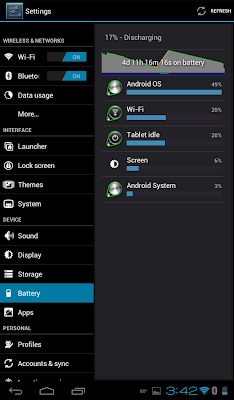 The "Battery" display shows which resources have consumed the battery. 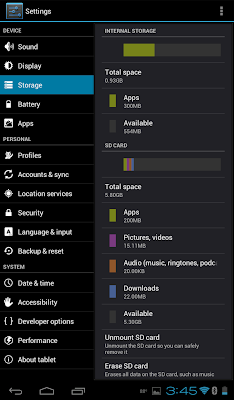 In the "Apps" display you see how much memory each application is using. If you tap on an app you get more details. 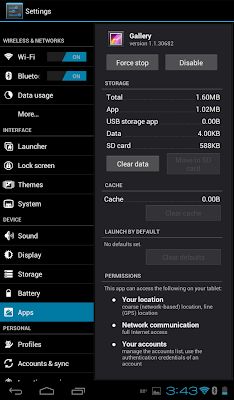 But notice that you can "Disable" an app from here. 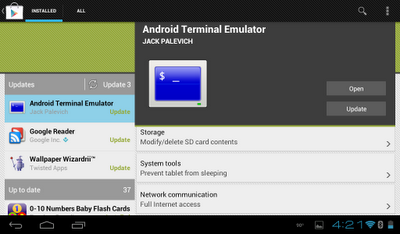 That is similar to "freezing" an app with Titanium Backup in prior versions of Android. The "Performance" setting gives a strong warning when you tap it. 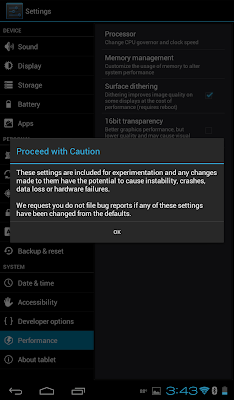 You can tweak many parameters affecting performance and battery consumption. You can see that I'm overclocked to 1100 MHz. Also that I don't have "Set on boot" checked. This means that if the Nook reboots it defaults to stock clockings. 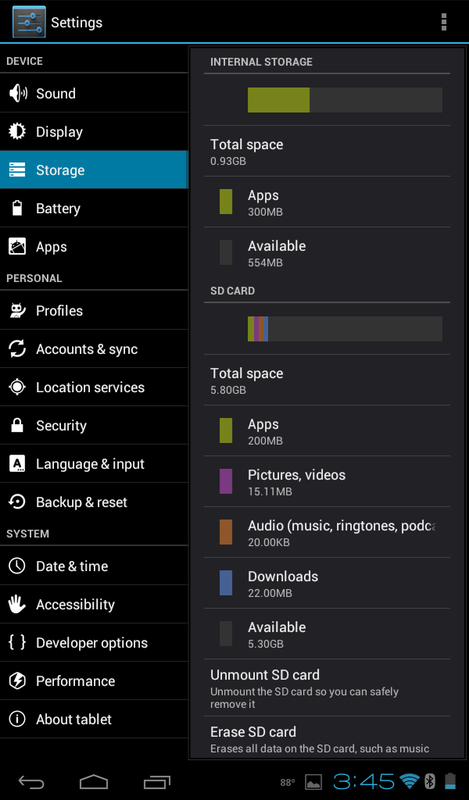 The "Storage" display shows internal and external SD storage. 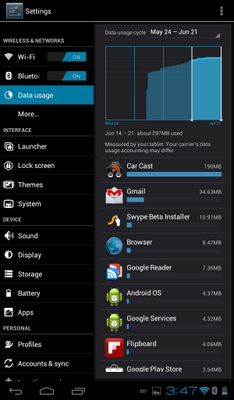 The "Data usage" display shows 3G or Wi-Fi usage by app. 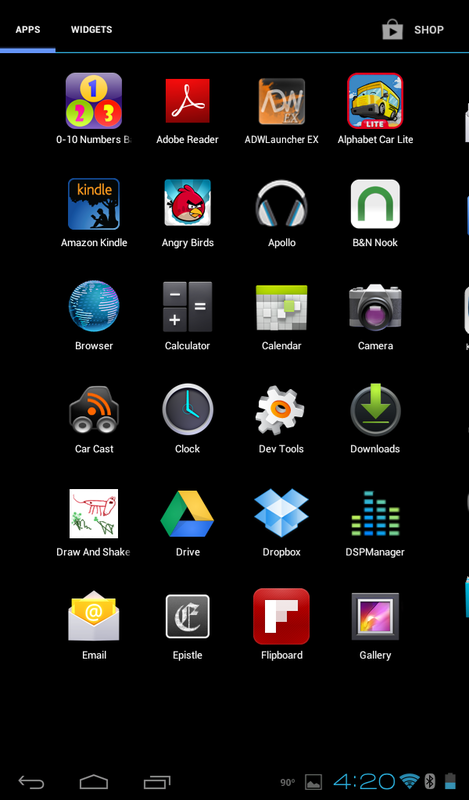 Tapping the "App drawer" icon at the top right of the homescreen brings up the App drawer. If you scroll the App drawer to the right you are shown the Wizards drawer. Notice the two column layout. While we're looking at this notice the three dots icon at the top right. 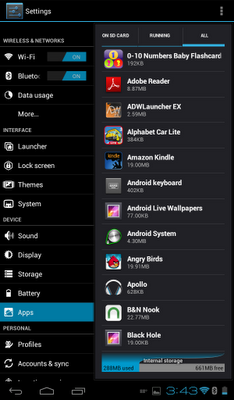 This is an ICS compatible app's Menu icon. 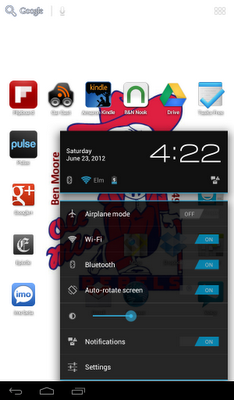 Since the Car Cast doesn't present the ICS Menu icon ICS provides to the left of the Notification area. 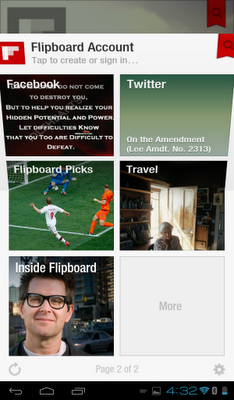 I'm running Flipboard as well. It complained of the screen size when I installed it but it has run fine. I show it here to illustrate that it is not tablet aware. You can tell it's flipping top to bottom like a phone rather than side to side like on the iPad. 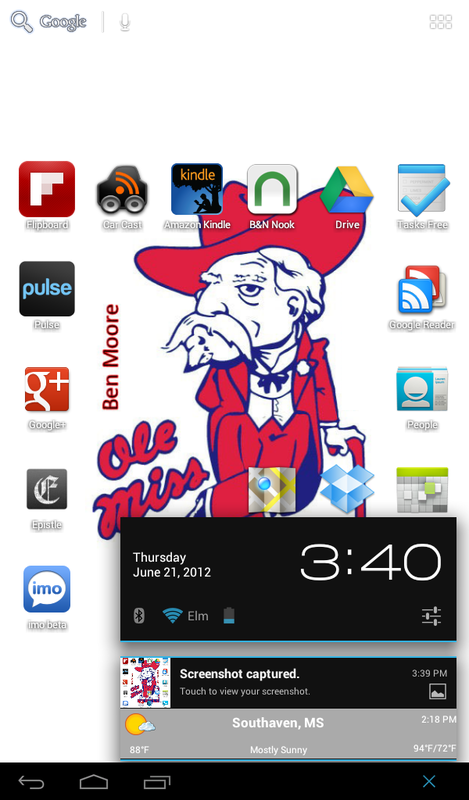 There's the Dismiss icon in the lower left to dismiss the keyboard. I worked for hours over days to get the wallpaper correct. I tried every size and every crop method I could find. Finally I came across a forum post referencing Wallpaper Wizardrii. Fixed it first time. Awesome. 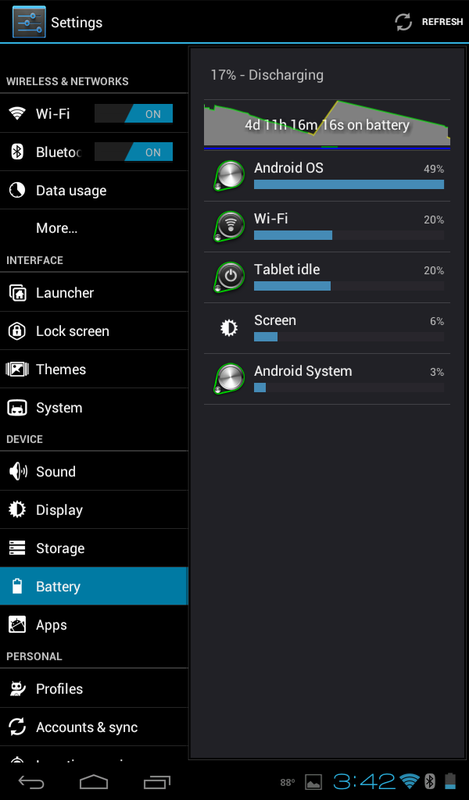 I have an issue with the battery icon still showing charging status after I had unplugged the charger. leapinlar suggested that I try resetting the battery stats. Let me net it out. 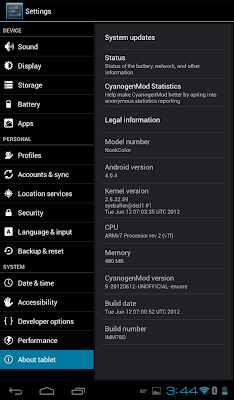 CWM is the same thing as ClockworkMod is the same thing as ROM Manager. 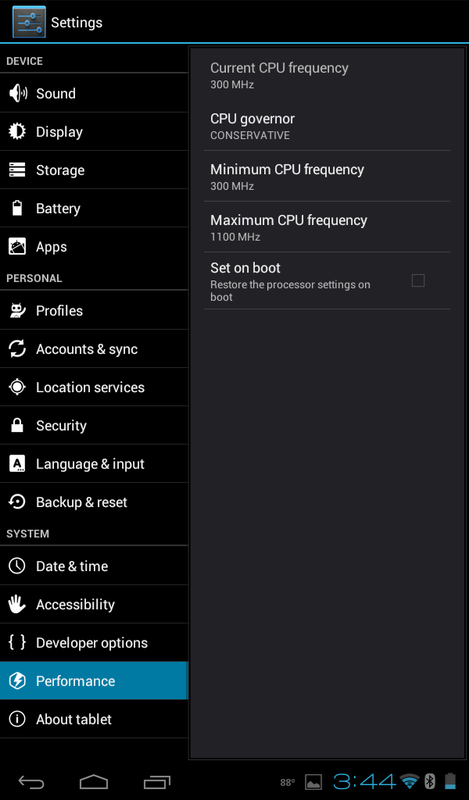 ROM Manager comes pre-installed on CM9. I accidentally tapped the top menu item and flashed ClockworkMod Recovery onto the eMMC recovery. 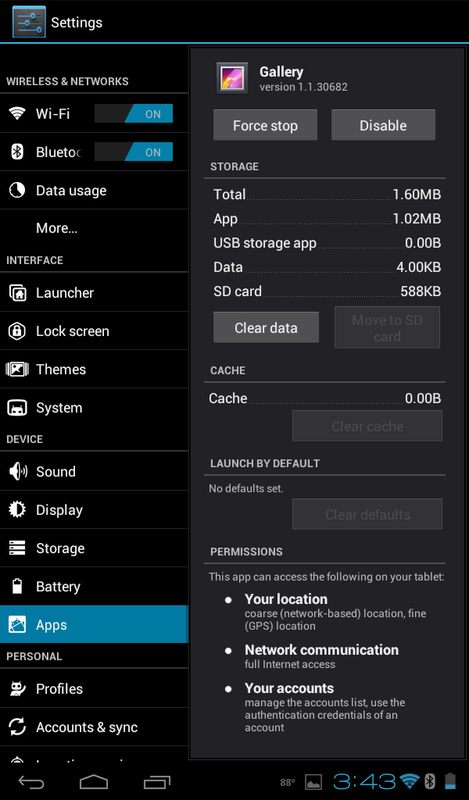 leapinlar has instructions on how to use a modified CWM recovery from a uSD in his tips thread. By the way that didn't help my battery indicator. I think it's a physical problem with the microUSB jack on the Nook. Since ICS isn't an "official" CyanogenMod release yet you'll probably want to flash a new "nightly" from time to time.